Mint marks identify coins stamped at each of the United States Mint facilities. The marks standardize production and establish responsibility for coinage. Use of mint marks dates back to ancient Greece and Rome. A March 3, 1835 Congressional Act established the practice in the United States, along with the first Mint branches in this country. When the Mint branches in Charlotte, Dahlonega, and New Orleans opened in 1838, mint marks made their first appearance on U.S. coins. Because of its secondary importance in any coin’s design, the mint mark is made as inconspicuous as possible without losing its function. Philadelphia was the only branch in operation in the earliest years, so identifying the sources of a coin was not necessary. The practice of not identifying Philadelphia’s coins continued even after the first branches were established. This changed, however, in 1942. 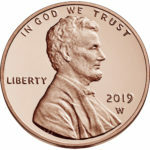 When nickel was removed from the 5-cent coins alloy during World War II, the mint mark moved from the right of Monticello to above the dome to indicate the substitute alloy. At the same time, the letter “P” first appeared on coins produced in Philadelphia. In July of 1979, the Susan B. Anthony dollar coin was introduced, replacing the larger dollar coin. Once again, the “P” mint mark appeared, this time on the dollar denomination. Denver coins have always carried the letter “D” except on coins dated 1965, 1966, and 1967 due to The Coinage Act of 1965. Use of the “S” and “W” mint marks was sporadic because of changing conditions. The “S” Mint mark was used on San Francisco coins until 1975, although production in San Francisco was suspended between 1955 and 1965. San Francisco made cents for circulation from 1968 through 1974, nickels from 1968 through 1970, and dimes in 1975. Circulating cents were manufactured in the early 1980s at San Francisco and the West Point Bullion Depository, but no mint marks were used, assuring maximum circulation of this small production. Special Mint sets were produced for collectors at San Francisco from 1965 through 1967, but no mint marks were used because of then-current restrictions. In 1968, proof coin production was moved from Philadelphia to San Francisco, where the proof coins gained the “S” mark. Proofs subsequently made at West Point carry the “W” mint mark. The coinage Act of 1965 prohibited mint marks for five years. This, together with the date freeze, eliminated distinguishing features that could tempt people to remove the coins from circulation while the Mint was striving to meet the country’s need for coins. No mint marks appear on coins dated 1965, 1966, and 1967. Congress authorized resumption of the practice in 1968, at which time the mint marks, which previously appeared on the back of the coins, were permanently relocated to the front. All master dies, including those used in the Mint’s numismatic and medal programs, are manufactured in the Die Manufacturing Division of the Philadelphia Mint. Mint marks are added to the hubs at Philadelphia. These hubs make the working dies used to stamp coins. Mint-marked working dies are then delivered to the appropriate Mint facility for use in coining. All the working dies needed for the Denver facility are produced by the Denver Die Manufacturing Division along with some of the dies for the San Francisco facility.